Back in January, Arsenal Inc. had some big news for AK fans at SHOT Show 2017; they were finally releasing a configuration which had been much requested by the AK community. The SLR-107R was revealed to the world, an entry-level, stamped receiver, fixed stock 7.62×39 AK built with the same standards, quality materials, and Arsenal brand worksmanship. The biggest news, however, was the price: only $879.99, the first time a rifle in the 107 series was available for under $1000 retail. The lack of a folding stock and 74-style muzzle brake is quite a departure from your usual Arsenal product. To some enthusiasts, the lack of certain bells & whistles may come as a downside. But to purists, entry-level hobbyists, and shooters who simply didn’t desire the extras, this rifle is just what they needed. 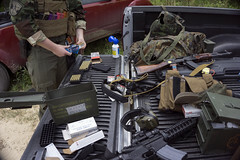 What you get is a very shootable rifle, complete with a sling, plastic oil bottle, bayonet lug, cleaning rod, cleaning kit, side rail mount, chrome lined barrel, and one 5rd magazine. What’s better is, out of the box, you can use surplus mags with this gun without having to worry about 922r regulations. When buying Arsenal, you can be assured of the quality of your product, which is a big reason why I opted to purchase one of these for myself. Before buying this AK, I had one of the “AMD-63” kit builds that were offered by Classic Firearms, which gave me a lot of problems. I ended up selling it to finance my SLR-107R. For somebody who doesn’t want to worry about the possibility of buying a lemon, I’d definitely recommend this gun. The fit and finish is amazing, all rivets are seated perfectly, and the sights are straight as a rail. The SLR-107R comes with a US made polymer stock set, which is available in black or “plum” (for a $20 upcharge). The buttstock has a scalloped metal buttplate with a trapdoor for the cleaning kit, and the lower handguard has a stainless steel heatshield. However, one of the greatest things about this gun is its potential for customization – being a fixed stock AK74-pattern rifle, it’s compatible with any fixed AKM or AK74 stock. I was already in possession of an East German MPi-KM polymer fixed stock set, but I opted to buy a surplus Russian blonde 74 set for my SLR-107R. As you can see, it looks beautiful. I am also using a slant muzzle brake for the old-style feel. 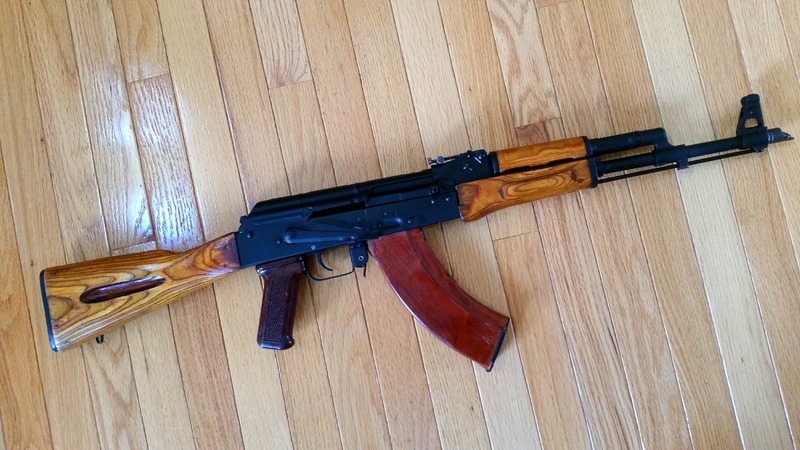 This is a great rifle for anyone looking to give their AK collection some real classic Communist aesthetics. Below are some pictures of my SLR in both East German polymer and Russian laminate furniture. My SLR-107R dressed up as an East German MPi-KM. As far as shooting goes, I’ve only had one chance to take this baby to the range so far, but it performed beautifully. It ate all the Tulammo I could feed it with no issues of any kind, and fed perfectly from the 5rd polymer mag it shipped with, 20rd Korean steel mags, and 30rd Russian bakelites. 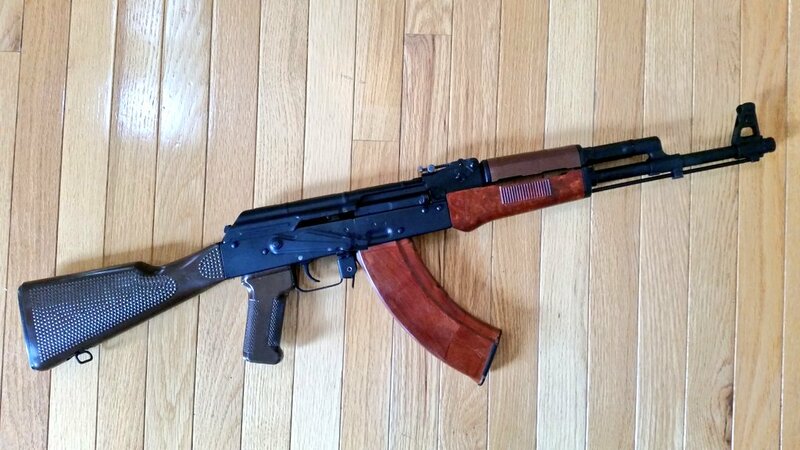 The cycling is very smooth, and I even noticed that the selector lever seemed somehow nicer than other AKs I’ve used. At this moment I can’t vouch for accuracy, as I was just burning through ammo for giggles, but you really only have to look at other Arsenal rifles to tell that accuracy will not be an issue. One complaint some people have about Arsenals is their “faux” two-stage trigger, but I’m fine with it for now. At any time you could easily replace it with a Tapco G2 which many AK shooters love. The same AK with Russian laminate AK-74 furniture. In conclusion, when you buy an SLR-107R you are getting the full package of everything you can expect from a 7.62×39 AK and more, for a price that gives you what I consider to be the best value-to-cost ratio on the market right now. This is a gun I can definitely see myself keeping for the rest of my life and giving to my children, and it will definitely outlast me. The rifle can currently be purchased on Atlantic Firearms website for $849.99. Makzimiser is a Kalashnikov & camo autist based in the central US. Is it just poor jealous people claiming Arsenals are inferior to WASRs? Mainstream AK groups tend to covet Arsenals while /k/ seems to bash them. is it possible to change the fixed stock and install a folding one? If you want the Arsenal AK-100 stock a trunnion change would be needed along with cutting in the receiver and some other hardware. These tend to bring the price around to where a good condition used folding stock one is (there are no new ones (except the few Kvar got of the SLR-107CR(which I got))). That’s if you have the tools and do it yourself, now figure in gunsmithing charges if you aren’t able. You can still switch it to other fixed trunnion folding stocks though, they just won’t be the right ones. This will make me do what I did seeing his rifle and get a strange feeling in my stomach when I see the old furniture with a 90° gas block that only go together on AK-74s.